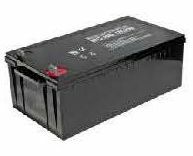 HTI&C is s a Moshav, Israel based manufacturer, exporter & supplier, invovled in offering AGM Batteries in the regional and global marketplace. To offer our purchasers top-notch range of products, we ensure only optimum grade supplies are utilized for their production. We have hired only professional packaging personnel who have experience and expertise in this domain. They make use of the finest quality packing material to ensure zero damage during transit. It’s our dedication and efforts towards offering top-notch products and making safe & secure shipment that we share a forefront with the celebrated AGM batteries suppliers in Israel.